Samsung Q1 is one of the first Ultra-Mobile Personal Computer UMPC (previously codenamed Origami) to launch in the market. Samsung Q1 intends to deliver high performance mobile computing with multimedia and the desire for a bold personal statement by combing the best features from PDA, MP3 and PMP player, Tablet PC and storage device. 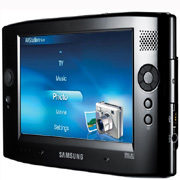 Features of Samsung Q1 UMPC include running on Intel Celeron M processor, DDRII 400 SODIMM memory socket, 7″ WVGA (800 x 480) LCD, and plenty of connectivity options including 10/100 Ethernet, Mini card WLAN (802.11 b/g), Bluetooth and more. The mobile device weighs 779 gram with dimension of 227.5 x 139.5 x 24.5~26.5 mm. BostonHerald reviewed Samsung Q1 and concluded that the UMPC is not a bad concept. It’s easy to carry around, and apart from the annoyances, the touch screen is an intuitive interface that’s much nicer than the touch pads of regular laptops. But integration and battery life need to improve before the UMPC is going to find its market. Microsoft has a track record as a tenacious improver, and its hardware partners will no doubt figure this one out. Check out more reviews of Samsung Q1 UMPC.